1852 (Jan. 20) Wady Halfa, Nubia Sudan to Hartford, Ct., long folded letter datelined "Wady Halfa, at the foot of the 2nd Cataract of the Nile" with some interesting local missionary activity content, mentions "bloody" Pasha of Egypt, camel trip to Cairo, laws against Jews, etc., "LS, 26 MR 26, 1852" Maltese cross transit and "19/ Cents" debit handstamp, carried by Cunard Africa from Liverpool Mar. 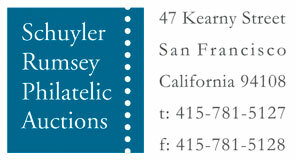 27th to New York arriving Apr. 7th, "Br. Packet '24' Apr 8" debit exchange cds, Very Fine. A RARE EARLY INCOMING TRANSATLANTIC COVER FROM SUDAN. Wadi Halfa is a city in the Northern state of Sudan on the shores of "Lake Nubia". It is the terminus of a rail line from Khartoum and the point where goods are transferred from rail to ferries going down the lake. The town is located amidst numerous ancient Nubian antiquities and was the focus of much archaeological work by teams seeking to save artifacts from the flooding caused by the completion of the Aswan Dam. 1852 (Apr. 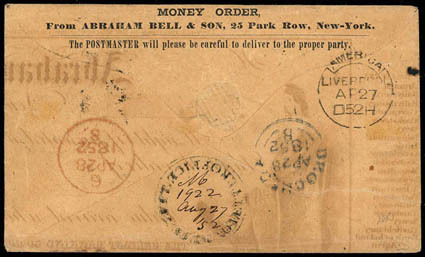 4) New York N.Y. to Drogheda, Ireland, buff envelope containing bank draft which accompanies, showing black "New York '5' Apr 13" integral debit exchange cds to G.B., sent unpaid on Cunard Line Canada departing Boston Apr. 13th to Liverpool arriving Apr. 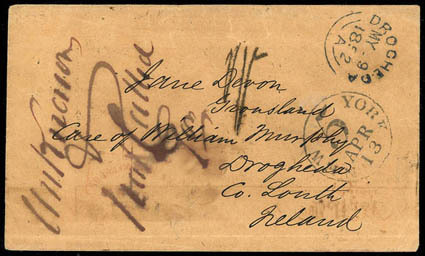 27th, Liverpool America (4.27) backstamp and "1/-" one-shilling due handstamp, red London (4.28) transit backstamp, Drogheda (4.28) arrival backstamp, the Drogheda post office marked "Unknown & Not Called For" along with its Drogheda (5.9) cds, the letter was returned to the U.S. and backstamped with Washington D.C. "Dead Letter Office" circular handstamp and manuscript "M, 1922, Aug 27 '52" filing, Fine. 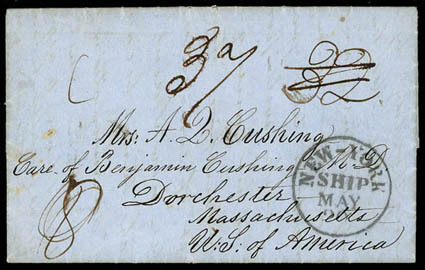 A SCARCE EXAMPLE OF A ROUND-TRIP TRANSATLANTIC DEAD LETTER, UNPAID IN BOTH DIRECTIONS. 1852 (May) Ship Loo Choo at Sea, North Atlantic to Dorchester, Mass. 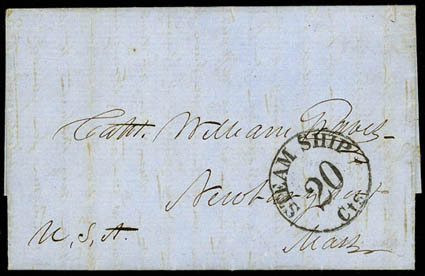 via Cowes, Isle of Wight, folded letter from sailor on board the ship Loo Choo in North Atlantic, latitude 29°N 11'W, which was transferred to another ship headed to England and landed at Cowes, "Cowes / Ship-Letter" backstamp, British manuscript "32" cent debit to U.S. for "8" pence (16¢) incoming ship fee plus 16¢ transatlantic packet service, carried by Cunard Line Africa from Liverpool May 8 to Boston arriving May 20, red "New-York 'Ship' May 20" exchange cds and manuscript "37" cent postage due with 5¢ added for inland postage, Very Fine, ex-Winter. The U.S.-U.K. convention of 1848 had a provision for this 37¢ rate, which is uncommon. The New York Ship cds is rare on transatlantic convention mail. 1852 (Jun.) Chincha Islands, Peru to Newburypor,t Ma., blue datelined folded letter with neat strike of New York "Steam Ship, 20 Cts" handstamp (Wierenga NY-39), Very Fine and scarce origin. 1852 (Sep. 10) Boston, Mass. 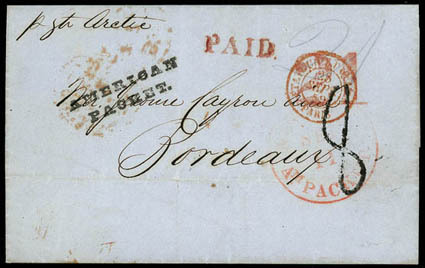 to Bordeaux, France, folded letter with black "American / Packet" two-line handstamp and red "Paid" and "21" rating handstamps, partial red "New York Am. Packet Sep 11" exchange cds, carried by Ocean Line Washington from New York Sep. 11th to Southampton arriving Sep. 25th, London (9.27) backstamp, Paris (9.28) entry cds with "8" décimes due handstamp rating, Very Fine and choice, ex-Winter. This was an unusual routing from Southampton to London and Calais, not the usual for Ocean Line mails to France. 1852 (Nov. 27) New York,N.Y. 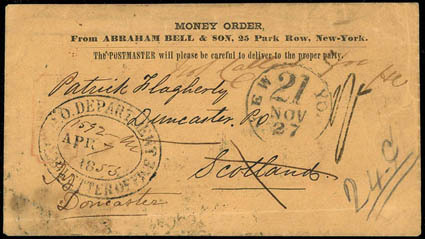 to Duncaster, Scotland, money order envelope sent unpaid with black "NEW YORK '21' Nov 27" exchange office debit cds to G.B., carried on the Collins Line Pacific departing New York Nov. 28th to Liverpool arriving Dec. 11th, Liverpool America (12.11) backstamp and matching "1/-" due handstamp for an unpaid packet letter, red Edinburgh (12.12) backstamp and "Try Doncaster" marked, Doncaster (12.13) arrival backstamp and later marked "Not Called for", Doncaster (1.10) backstamp and returned to the U.S., Washington, D.C. "P.O. 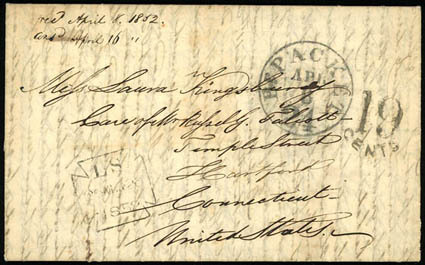 Department, Dead Letter Office, Apr" oval handstamp with "192 - M, Apr. 7, 1853" dating; minor soiling, otherwise Very Fine and scarce transatlantic Dead Letter Office use.